Preface of Sir Walter Raleigh's The History of the World, 1614. 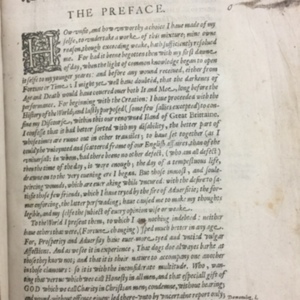 Preface page of the first edition of Sir Walter Raleigh's The History of the World. Folio sized page on rag-based paper by William Stansby. Illumination and printer's ornamentation evident with a booktrace that reads, "W: Wyuill 12:01-00-00"
Sir Walter Raleigh; William Stansby (printer), “Preface of Sir Walter Raleigh's The History of the World, 1614.,” UVic Libraries Omeka Classic, accessed April 21, 2019, http://omeka.library.uvic.ca/items/show/1132.